Murphy Dome Air Force Station (1951-Present) - A Cold War U.S. Air Force Station, part of the Alaska AC&W Radar Network. Initially functioned as a Ground Control Intercept (GCI) radar site, with a Permanent System ID of F-02. Later redesignated a surveillance site and manual Direction Center. Became a minimally attended radar site in 1992 and was redesignated as Murphy Dome Long-Range Radar Site with a JSS ID of A-02. Now feeds radar track data to the FAA Anchorage ARTCC (ZAN) and to the Elmendorf NORAD Regional Air Operations Center (RAOC). Active Long-Range Radar Site (LRRS) with an FAA ID of ZMPY. 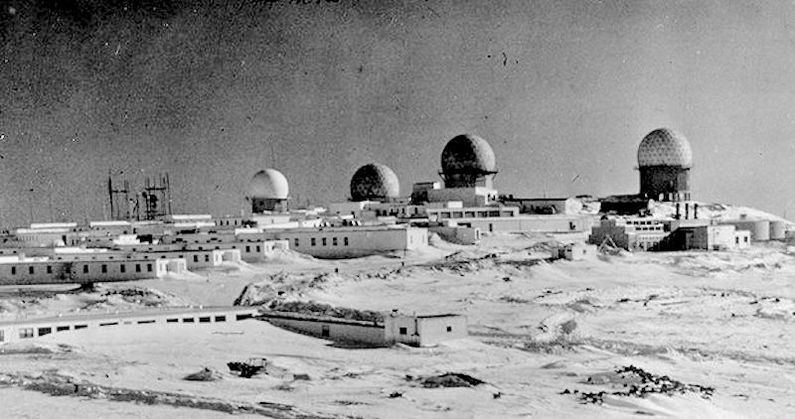 Murphy Dome Air Force Station in the 1960s. Construction began in June 1950 and was completed in July 1951 by two companies, Peter Kiewit and Sons and Morrison-Knudsen Construction Company for a total of $4,581,777. The site was partially operational in September 1951 and fully operational in the spring of 1952 as Murphy Dome Air Force Station. Initially manned by a detachment of the 532nd Aircraft Control and Warning Group and later by the 744th AC&W Squadron. Initial equipment included the CPS-6B search radar and one FPS-8 height-finder radar. The radars were upgraded to one FPS-20 search radar and one FPS-90 height-finder radar. Later the FPS-20 was upgraded to a FPS-93A search radar. The North American Aerospace Defense Command (NORAD) and the Alaska NORAD Region (ANR) were created in 1957. Murphy Dome AFS became one of four NORAD Control Centers in Alaska. Murphy Dome AFS shared its radar data with the U.S. Army Air-Defense Command Post (AADCP) FSQ-34 Nike missile-defense system in the Fairbanks Defense Area (1959-1971). The CPS-6B radar was removed in July 1958, the FPS-8 was active until the Nike sites were inactivated in 1971. The GPA-37 Course Directing analog computer system was installed in the 1960-1961 time frame. The FYQ-9 Semiautomatic Data Processing and Display System became operational in 1965, eliminating the need to pass aircraft track data manually. A FPS-117 Minimally Attended Radar (MAR) was delayed and not installed until the summer of 1992. The site was re-designated as Murphy Dome Long-Range Radar Site. The Long-Range radar site was connected to the Elmendorf JSS ROCC which had been activated on 14 Jun 1983. The FPS-117 radar fed data to the ROCC FYQ-93 computers via satellite. By 2011 the MAR FPS-117 radars were outdated and increasingly unsupportable because parts and components were no longer available. In 2011 the U.S. Air Force awarded Lockheed Martin $46.8 million in contract options to begin modernization of 29 long-range radars. Under the EPRP contract, Lockheed Martin was to modernize 15 radars in Alaska including Tin City. The last FPS-117 site was upgraded in June 2015. 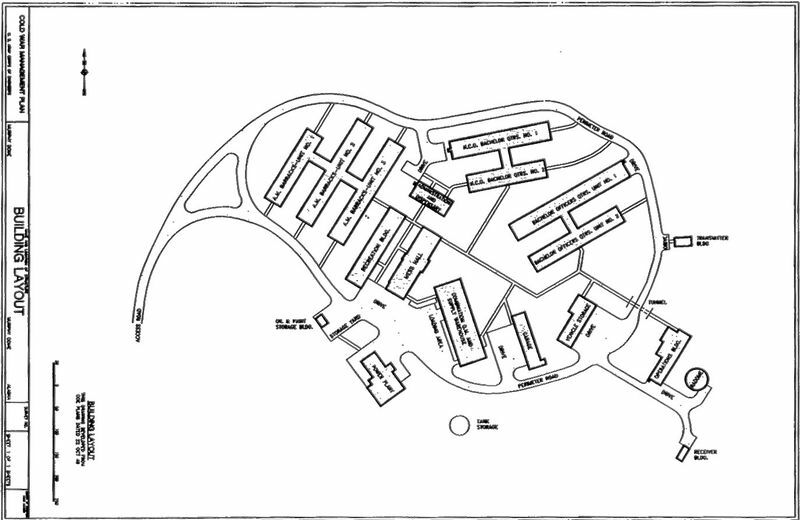 The physical plant of the site was originally divided into the main site, a cantonment area, and two radio sites. The main site housed the radar towers and the operations building. The cantonment area housed two sets of Bachelor NCO Quarters, three sets of Bachelor Airmen Quarters (BAQ), two sets of Bachelor Officer's Quarters (BOQ), the orderly room, the dining hall, power plant and other support areas in a series of interconnected frame buildings. No family housing was provided as this was considered a remote unaccompanied tour (1 year). The picture above shows the site in the 1960s with four radomes in place. A separate radio site housed the radio equipment for directing aircraft intercepts. Initially, two radio sites were built, one for receivers and the other for transmitters. These were consolidated into an original transmitter site by the time the photo above was taken in the 1960s. The radio site can be identified by the tall antenna poles on the left side of the photo. A steel operations LRRS building was built to support the FPS-117 MAR radar. The former AC&W buildings were left standing and boarded-up for years. One of the two original radar domes was modernized to house the FPS-117 and the others were leveled. After HF systems proved inadequate for command and control communications, the Air Force implemented the White Alice Communications System. This was a system of tropospheric scatter and microwave radio relay sites constructed during the mid-1950s to provide reliable communications to Alaska Air Command (AAC) AC&W system. The Murphy Dome White Alice TD-2 Microwave Site was activated on May 1957. It was inactivated in May 1979 and replaced by an Alascom-owned satellite earth terminal. Spring 1952 - Detatchment, 532nd Aircraft Control and Warning Group. 1 Feb 1953 - 532d Aircraft Control and Warning Group. 1 Oct 1977 - 531st Aircraft Control and Warning Group. 1 Jul 1981 - 11th Tactical Control Group. 1 Nov 1983 - Inactivated. Active long-range radar site but most of the old AC&W site buildings have been demolished. The site has also had an environmental remediation project that has further erased signs of the old AC&W site and the White Alice tropo site. What remains is the FPS-117 Building and the steel operations LRRS building. Location: Near Fairbanks in Fairbanks North Star Borough, Alaska. Denfeld, D. Colt Ph.D., The Cold War In Alaska: A Management Plan For Cultural Resources, 1994-1999, U.S. Army Corps of Engineers, August 1994, 327 pages, Pdf, page 161-162. History of the Aircraft Control and Warning System in Alaska: Air Defense of Arctic Skies, Argonne National Laboratory, Illinois, 2002 updated 2013, 140 pages, Pdf, page 32-34. This page was last modified 18:17, 7 January 2019 by John Stanton.